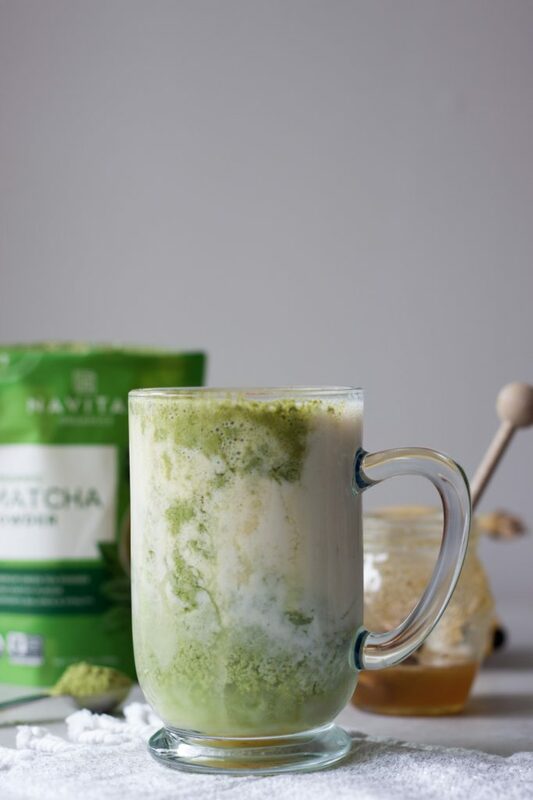 Mixing things up with matcha and this Iced Nana Matcha Latte! Yes I know you might be thinking another nana latte, and yes I went with nana instead of banana since I did it with the Iced Nana Latte and Iced Nana Mocha without realizing until I finished the post so sticking to it. As I wrote about in those posts coffee early in the morning on an empty stomach wasn’t agreeing with me so Iced Nana Lattes were my solution for early morning workouts as well as an afternoon pick me up. Well I switched it up again and swapped the coffee for matcha to see how it went and I love it! Even better for afternoon pick me ups and even great for those afternoon barre classes which aren’t the norm but have happened in the past couple months here and there for one reason or another. So before getting into fall drinks, aka pumpkin, I’m sharing this Iced Nana Matcha Latte. Shocking and so not me but I haven’t gone pumpkin crazy yet which usually happens by this time of year. This year is a little different with wanting apples (duh, but usually comes with pumpkin), cinnamon, salted caramel, and honey. Just in the drinks and basic flavors and not talking about all the squash love. Matcha is a great swap for coffee for so many reasons and honestly I don’t miss the coffee when I swap it out. NO I haven’t given up coffee, I’m a huge coffee lover and love all aspects of coffee but there have been days I have gone without coffee (shocking and on rare occasion) but done just fine. It supports energy and alertness but at the same time is calming, it’s crazy like that! It’s packed with antioxidants and we’re talking about 10 times as much per cup compared to green tea. It not only gives me the energy but I feel so much more focused when drinking a matcha latte and a sense of calm verses crazy. Hard to explain and again I still love my coffee but on how I feel alone and how my body reacts if I had to only pick one it would be matcha. That said flavor, smell, craving wise and just overall love I still want my coffee. I due find myself craving matcha more though as I find ways to enjoy it so I’m going to keep playing and find that love at first sip drink. I can’t say I’ve always loved matcha but I do like it and find I’m loving it more in recent years but it comes down to finding a good matcha and how it’s prepared. 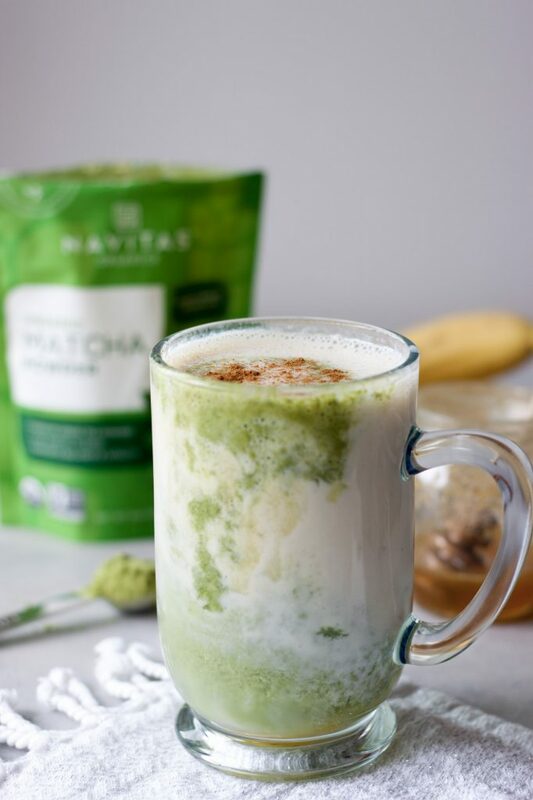 Lately I’ve been using Navitas Organics Matcha powder as it’s so versatile and I love Navitas products and the brand. I have tried many others and even have a few others in my cupboard. I would just say do your research so you know what you are getting. The girls have some flavored matchas and with those there is already sweetener in them, sweetened with coconut nectar, but still just be aware of what you are buying. Now I know there are many out there that don’t like matcha or are scared to try it. This is a great starter recipe or if you didn’t like it before give it a try again as the banana not only makes it creamy but tones down the matcha. 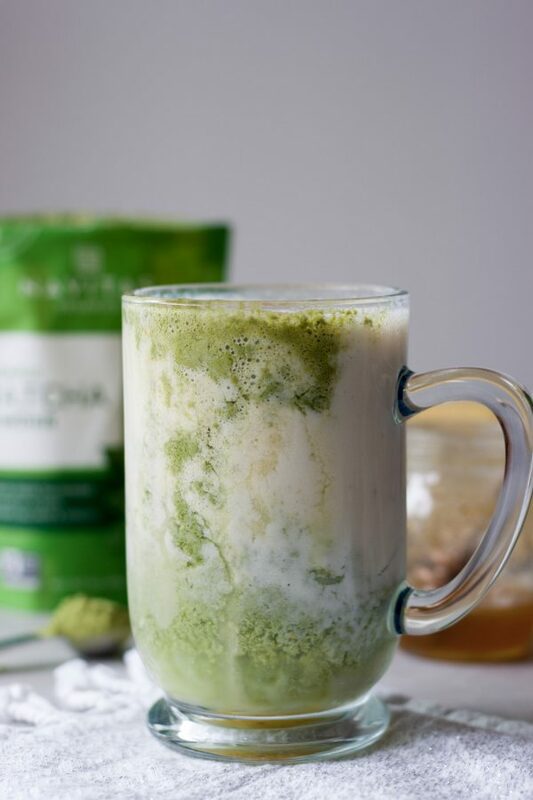 If you’re a matcha lover you can adjust and even use 2 teaspoons of matcha doubling up. This recipe can quickly be blended for the on the go but when I’m enjoying one at home I like to layer them like this and watch it, I find it calming and sip it a little slower too. 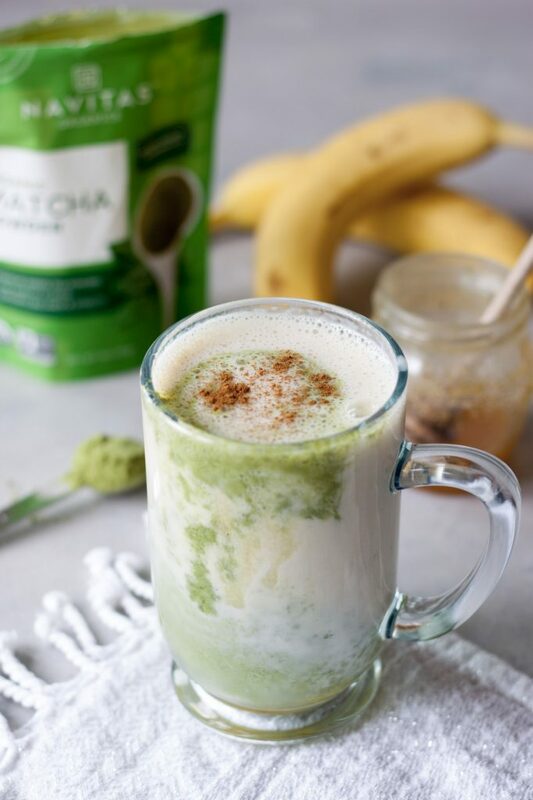 Pouring the matcha over the banana milk mixture or the banana milk over the matcha, the choice is yours. If I’m doing a longer workout I might add a little coconut oil or gelatinized maca powder. If it’s in the afternoon as a pick me up maybe adding in a little collagen, reshi, or ashwagandha. Time of day I’ll vary the adaptogens I might add. Looking to get more protein I make it with plant-based protein milk Ripple, or depending on what I have on hand and my mood I’ll use almond or coconut milk lately loving New Barn Barista Milk (love this steamed in my lattes and coffee drinks). I get asked for my favorites but those depend on my mood so I try to give insight and inspirations with the options I use in daily life. I give the basic and then try to add notes to my recipes. I know I can’t be the only one that varies things and their favorites based on when they are enjoying them, their needs, and their mood. Usually I’m not a sweet coffee person and stick with an Americano or plain latte, sometimes a vanilla latte. Then there are other times where I get in a sweet mood or crave a salted caramel latte or mocha but they are not my go-to. Although there have been weeks lately where I will want an Iced Salted Caramel Mocha multiple times but they do fill me up and I’m not hungry later so I plan accordingly and those are usually more of a treat or when I’m on the go and not eating for a few hours. So two or three in a week and then won’t crave or have them for months or a year. I’m all about intuitive eating and living my best life. That means giving into cravings, not restricting myself, listening to my body, and trying to fuel my body so I feel good and can live life to the fullest while still enjoying life. That healthy happy balanced life. 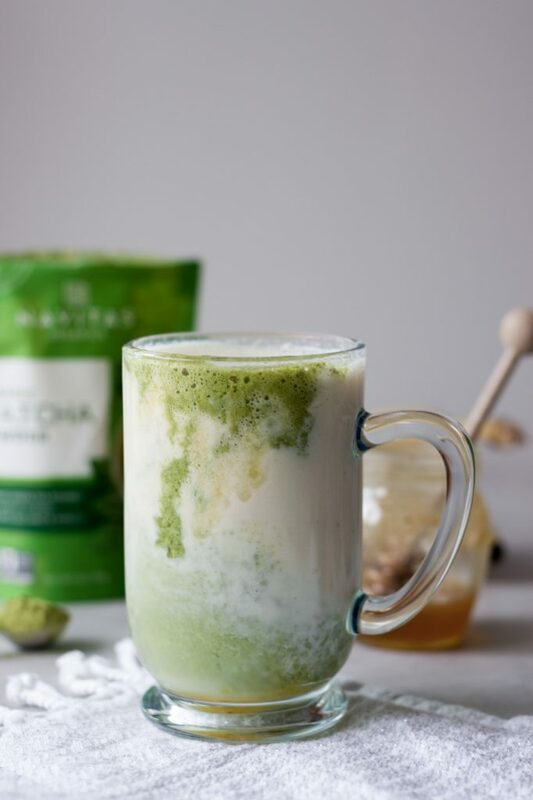 Are you a matcha drinker? Creamy delicious blend of dairy free milk and banana topped or blended with matcha and sweetened with honey (or agave for vegan). Customizable with many options and superfood and adaptagen add-ins. Heat water to 160-170F to make matcha if not blending in. In a Vitamix, or blender, blend milk, banana, optional add-ins (see notes) and honey (unless you want to drizzle the honey on the inside of the glass). Pour into ice filled glass. In a small bowl or cup whisk matcha and warm water together. If you don't have a matcha whisk you can always throw it into the Vitamix to blend. Pour over top of nana milk blend. Alternatively you can blend matcha in with the milk and banana and omit water. You can also reverse the order and add matcha to a glass full of ice and top with the banana milk mixture. For stronger matcha flavor use 2 teaspoons and double water. Play around and add coconut oil, ghee, collagen, maca, ect to taste/needs. I have only tried adding 1 teaspoon of coconut oil, maca, collagen, and ashwagana (not all at the same time).